In contrast to nerves in the central nervous system, peripheral nerves are highly regenerative following injury. Regeneration is critically dependent on Schwann cells, the main glial cell type of the peripheral nervous system, but whether an additional stem cell or progenitor population also contributes has been a matter of contention. A paper in Development now addresses this issue with a characterisation of Schwann cell behaviour in the homeostatic and regenerating mouse peripheral nerve. We caught up with first author and PhD student Salome Stierli, and her supervisor Alison Lloyd, Professor of Cell Biology at the MRC Laboratory for Molecular Cell Biology at University College London, to find out more about the story. Alison, can you give us your scientific biography and the questions your lab is trying to answer? AL I trained as a biochemist at University College London (UCL), before studying for my PhD with Chris Marshall and Alan Hall at the Institute of Cancer Research, also in London. To work with Chris and Alan was the best possible start to a career in science and they remained my mentors until their untimely deaths in 2015. After my PhD, I did a couple of post-docs in Strasbourg and at the Imperial Cancer Research Fund in London, interspersed with a three-year break during which I had a baby and worked as an IP administrator with the Ludwig Institute. I returned to UCL to start my own laboratory at the MRC Laboratory for Molecular Cell Biology in 1999, and I have remained here ever since. Throughout my career, I have always been a cancer biologist, and intrigued by how we can stay ‘normal’ for so long (homeostasis), and what causes these controls to break down (cancer). While initially I started by studying oncogenic signalling pathways in cells, it became increasingly clear that to answer these questions required an understanding of cell signalling within the context of tissue biology. The peripheral nerve has become our tissue of choice for these questions, and the biology of this tissue enables us to address many fundamental biological questions. Peripheral nerves mainly consist of neurons and glia (Schwann cells), and the behaviour of each cell type is controlled by interactions between them. 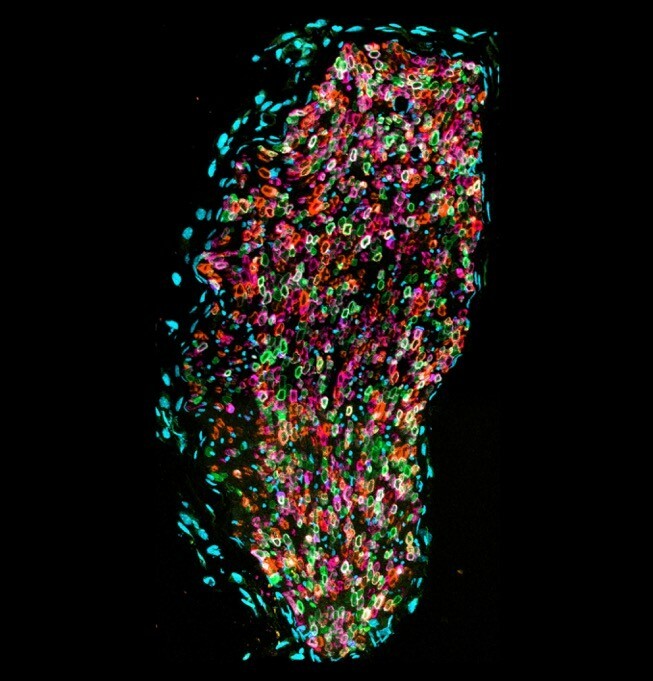 Crucially, peripheral nerve is a regenerative tissue, and we can use it to understand the multicellular response allowing tissues to switch between normal and regenerative states, which has important implications for multiple aspects of tumourigenesis. We continue to ask questions about how cells talk to each other to create a tissue and reach a homeostatic state, how the tissue is reprogrammed to regenerate following injury, and how this is relevant to the processes of tumourigenesis. 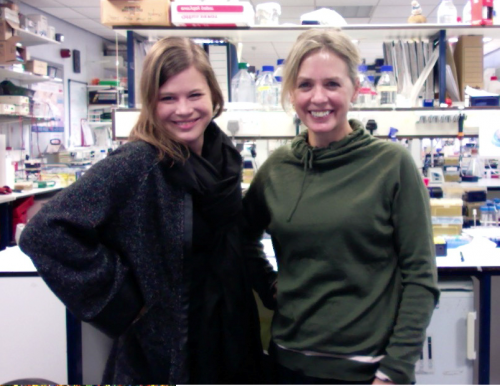 And Salome, how did you come to join the Lloyd lab, and what drives your research? SS I joined the Lloyd lab as graduate student fascinated by the biology of the nervous system. Prior to joining the Lloyd lab, I had been working on glioblastoma signalling in the group of Brian Hemmings in Basel, and ever since that time I have been highly interested in understanding the mechanisms that drive tumour formation within the nervous system. The extensive expertise of the Lloyd lab in understanding the mechanisms of peripheral nervous system (PNS) regeneration and tumourigenesis, and the lab’s use of tissue regeneration as a model for multiple aspects of tumourigenesis, provided me with the best environment to pursue my research interests. Why has there been controversy over the existence and activity of stem cells in peripheral nerve regeneration? SS & AL Adult stem cells exist in most tissues and have important roles in maintaining these tissues and/or in their response to injury. In peripheral nerve, mature adult Schwann cells were known to be able to re-enter the cell cycle, but to many it seemed likely that a stem cell population either ‘helped’ in the regeneration of this tissue and/or was the cell of origin for Schwann cell-derived tumours. Such a progenitor population exists in the central nervous system (CNS); for example, oligodendrocyte precursor cells produce oligodendrocytes (the corresponding cell to the PNS Schwann cell) throughout life. Previous studies have suggested that skin stem cells could contribute to the regenerative process, whereas other studies have suggested that adult Schwann cells retain a certain level of multipotency. However, most of these studies have been performed in vitro or in relatively non-physiological conditions. SS & AL We show that peripheral nerve regeneration is underpinned by the proliferation of mature cells rather than the activation of a stem cell population. In particular, we demonstrate that although Schwann cells are highly quiescent, stable cells in the adult nerve, they all retain the capacity to dedifferentiate to a proliferating, migratory, progenitor-like Schwann cell following nerve injury. Moreover, these progenitor-like cells remain restricted to the Schwann cell lineage with both a tumorigenic mutation (loss of Nf1) and a conducive microenvironment required to enhance their plasticity. A transverse section of an adult sciatic nerve from a mouse in which myelinating Schwann cells have been labelled with Confetti fluorophores (P0-CreERT2:Confetti). Why do you think there are such distinct mechanisms for maintaining the myelinating cells of the PNS and CNS, cells that seem to do similar jobs in similar environments? SS & AL We can only speculate upon this, but it is likely to reflect a trade-off between plasticity and stability: the CNS requires increased plasticity to myelinate new axons during processes like learning, for example, while the PNS requires stability to transmit signals from the CNS to tissues and organs. Moreover, although a continually proliferating progenitor population provides a rapid source for new myelination, it is also a pool susceptible to tumour development. This has been shown for other tissues, where the presence of proliferating stem or progenitor cells was correlated to enhanced susceptibility to tumourigenesis. Consistent with this, malignant tumours are more frequent in the CNS compared with the PNS, which perhaps reflects the presence of a more susceptible, proliferating progenitor population. Does your work offer any clues for how we might enhance peripheral nerve regeneration in a clinical context? SS & AL Yes, it suggests that stem cells are unlikely to be beneficial for improving peripheral nerve repair; encouraging the nerve’s ‘natural’ regenerative processes is likely to be the best approach. In addition, we suggest that the function of a regenerated tissue could be improved by clearing the matrix that accumulates but isn’t removed naturally following an injury. When doing the research, did you have any particular result or ‘eureka moment’ that has stuck with you? SS One of the most exciting moments in the lab was when we performed correlation light electron microscopy (CLEM) in order to clarify the plasticity of myelinating Schwann cells (mSCs) following nerve injury. The protocol took a while to perfect, but the moment we first managed to visualise the mSC-derived cells associated with small calibre axons was so rewarding that all the long hours and the effort was forgotten. SS Yes of course: in general behind each scientific paper there are years of hard work that includes many failed experiments and some particularly frustrating moments. During this project, very frustrating moments involved spending many days preparing precious samples only to encounter technical issues with confocal microscopes. I have also experienced the difficulties of working with live animals, as this involves the impact of factors that are completely out of your own control. SS I am about to complete my PhD and I am thinking about doing a postdoc in in the field of cancer biology. Prior to that, I am planning to write a review on the plasticity of myelinating Schwann cells. I have not decided yet which lab I will join for my postdoctoral training, but in general I am very interested in extending my skills, for example by learning cutting-edge techniques such as in vivo imaging in order to elucidate the processes driving the early stages of tumour formation. Where will this work take the Lloyd lab? AL This work has increased our understanding of the cellular environment of the peripheral nerve, and has provided us with a tool-box to gain a greater understanding of how the environment of the nerve can be regenerative but also how it can provide a tumourigenic environment. We are currently exploring how the microenvironment of the nerve can both promote and inhibit tumourigenesis, and this work is a fundamental starting point to that question. This work has also shown that the reprogramming of a mature Schwann cell to a progenitor cell is a remarkably efficient process. We don’t understand how this works and that is an important question for the lab. In this paper, we have also characterised a new cell type in peripheral nerve, which we have called tactocytes. I want to know what they are doing! Finally, let’s move outside the lab – what do you like to do in your spare time in London? SS I must confess that in the last year of my PhD, spare time outside the lab has been fairly rare. However, when I got some time outside of the lab, I particularly enjoyed exploring the vibrant art and music scene in London and simply having a good conversation with friends over a nice meal. I also enjoy exploring the countryside outside of London and love to travel to new places. AL I am a new grandma!